I’m Brigit, Founder of Biddy Tarot and author of the best-selling book, The Ultimate Guide to Tarot Card Meanings and The Biddy Tarot Planner. I’m so glad you’ve found your way here (and trust me, it’s no accident). Let me take a wild guess – you’re here because you want to improve your intuitive Tarot card reading skills, right? So, you’re torn in two directions. On the one hand, you want to connect and talk with other people who read Tarot cards… But on the other hand, you’re not totally sure you want the people in your everyday life to actually know you’re pulling cards and listening to your intuition. 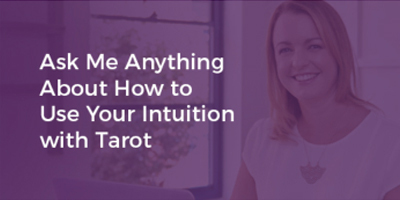 Well, what if I were to tell you that there is a safe, supportive place just for you to practice your Tarot reading skills, boost your confidence, and completely trust your intuition? And even better, what if that place was filled with over 1,000 people from 55 different countries who LOVE Tarot just as much as you do and want to see you succeed? All that (and more) is inside of the Biddy Tarot Community. You are warmly invited to join the Biddy Tarot Community! A global community of over 1,000 modern soul-seekers who are improving their Tarot reading skills and connecting more deeply to their intuition in their everyday lives. Now more than ever, all kinds of people are looking for answers within themselves. 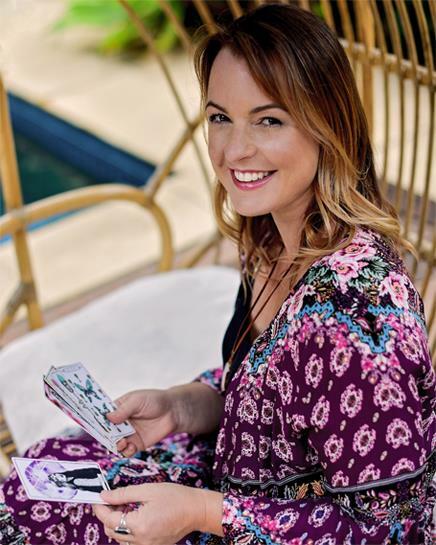 Whether you’re a healer or corporate executive, an artist, mechanic, mum or nurse, the Biddy Tarot Community gives you the support, community and nurturing to deepen your connection with your intuition using Tarot! 1. We’ll help you create your TarotPath™. 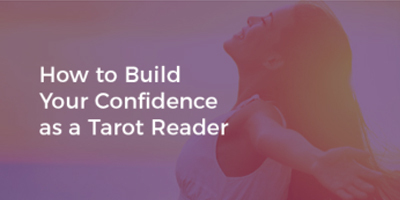 No more going in circles – we’re going to help you get complete clarity around what you need to do to become a confident, intuitive Tarot reader with our exclusive TarotPath™. The TarotPath™ is your personalised map for improving your Tarot reading skills. Take the quiz to understand where you are right now, and map out your next steps towards becoming a better Tarot reader. 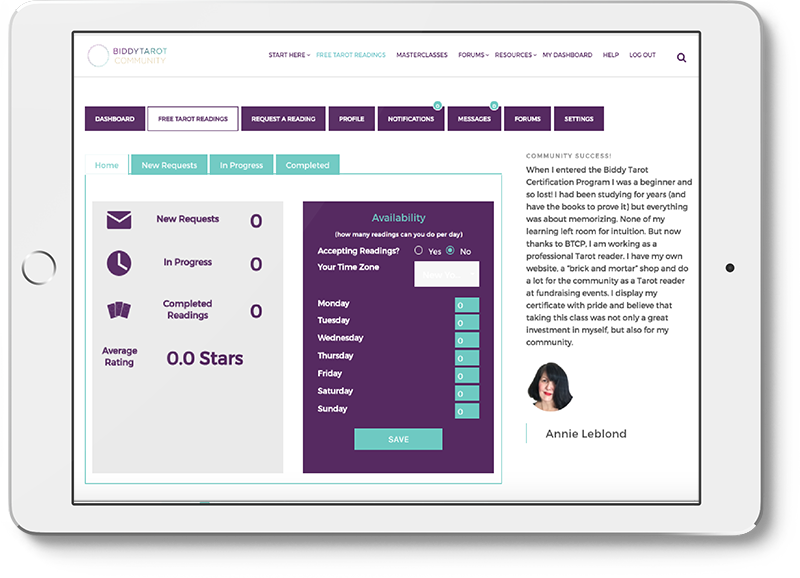 Plus, discover how the Community tools and resources will support you along the way. 2. We’ll teach you the Tarot reading skills . Once you’ve mapped your TarotPath™, we’ll teach you the skills to improve your Tarot readings and boost your confidence with our library of 25+ Tarot Topics (incl. Masterclasses, Q&A calls, worksheets and bonus resources). Learn at your own pace and choose the topics that resonate with you most. 3. 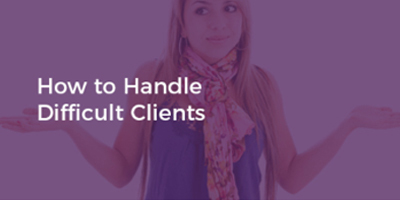 We’ll help you practice your Tarot readings with REAL people. 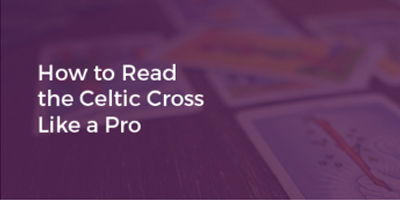 Time to implement what you’ve learned and hone your Tarot reading skills even more. With the Free Tarot Readings platform, you can practice your Tarot readings online with real people, in exchange for experience and feedback. This is by far the BEST and FASTEST way to become a confident Tarot reader. 4. We’ll support you every step of the way . You’ll have group support on tap 24/7. Have a burning question about Tarot? Need a second opinion on a reading? Or just need some moral support? 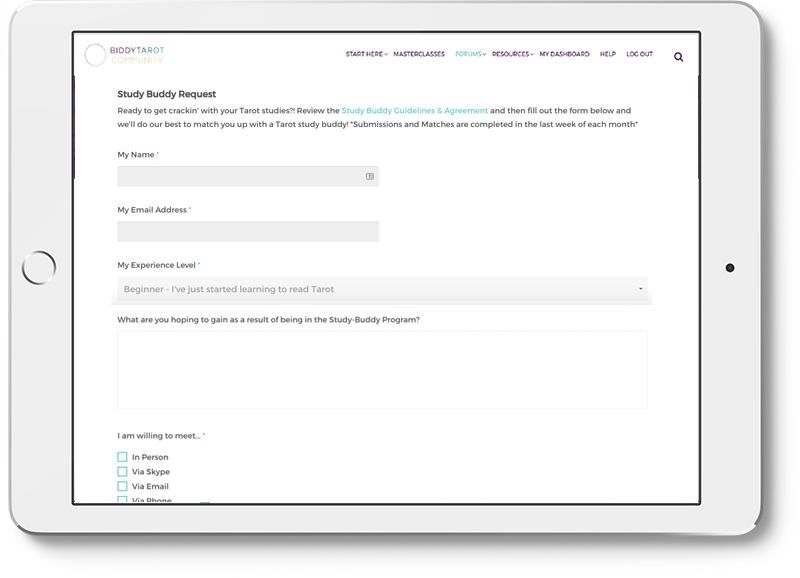 Reach out inside of the private discussion forums or find a personal study buddy. We’re all here to help you (1000+ of us!). Bob Molloy complete more than 80 Tarot readings that boosted his confidence to become a professional Tarot reader! Izabella Peregrino reignited her passion for Tarot after feeling disconnected and disappointed by the online Tarot world. I joined the community and felt like I had come home – I was able to connect with other people that were just like me; Simply a person that felt the pull to the cards, and tapping into the power of intuition. Being able to read for others in a safe and controlled environment is an invaluable bonus! I recommend Biddy Tarot to everyone I know that is interested in reading. My knowledge about Tarot has grown by leaps and bounds! Brigit makes learning the Tarot so much easier than any other community or program I’ve come across. Look no further, you’ve found your tribe! To know that there are spiritual souls out there like me, I now feel like I have a family, no longer feeling alone somewhere in space. This community gives me so much inspiration to continue to study, plus never let go. Yes there will be challenges, but I can make it! Biddy Tarot is the most reputed place to learn tarot. We are a Community of people who love tarot fearlessly, and believe in helping and empowering humans through this versatile tool. It is the best place to grow if you wish to pick tarot as your friend and guide! 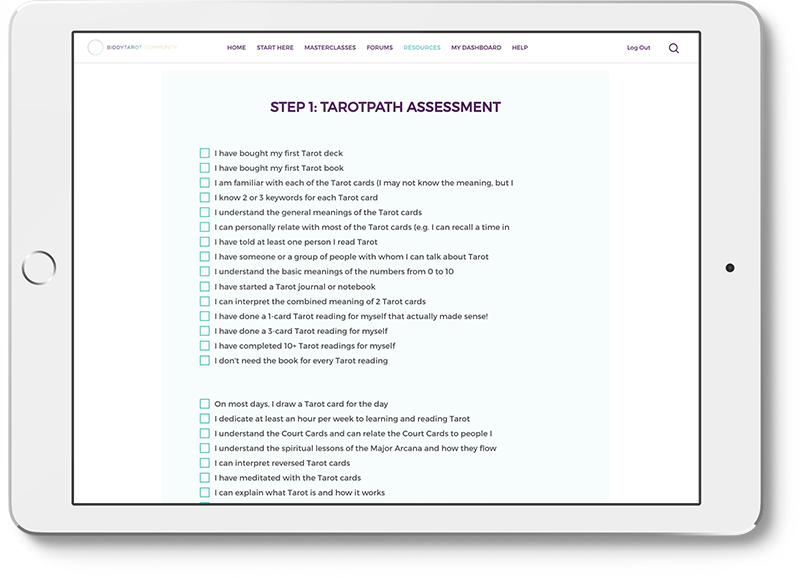 The TarotPath™ is your personalised map for becoming a better Tarot reader. Take the quiz to understand where you are right now, map your next steps and track your progress as you improve your skills. 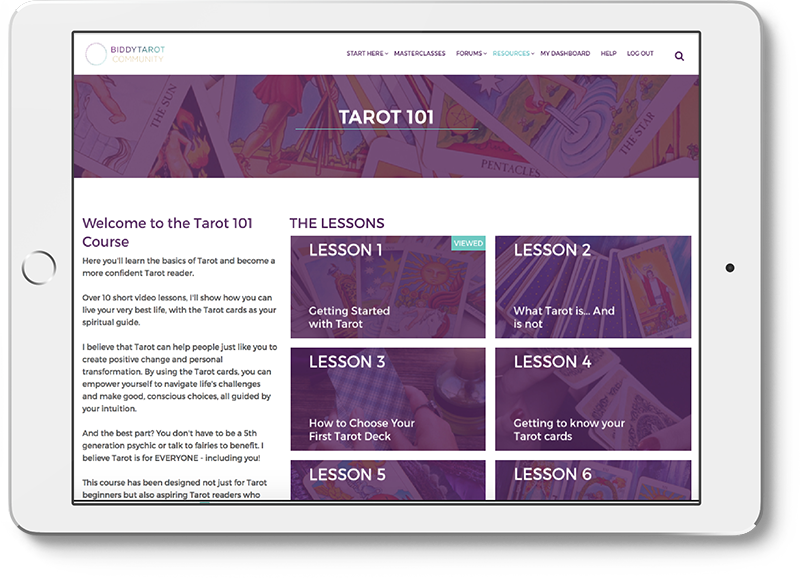 Develop your Tarot reading skills with monthly Tarot Topics, including step-by-step Masterclasses, worksheets, live Q&As, fun community challenges and bonus resources. 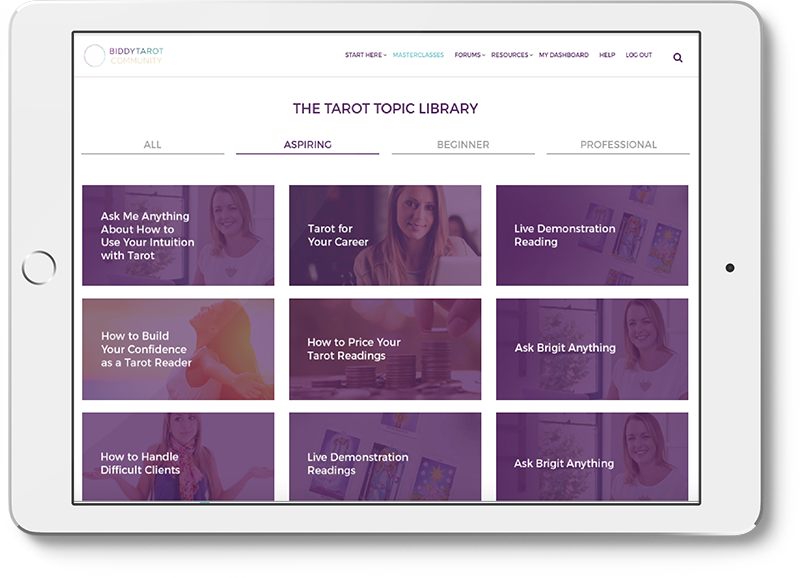 Get instant access to our growing Tarot Topic Library with over 25 topics available (and many more to come!). When you’re ready to implement what you’ve learned, we make it easy to give free Tarot readings to the public, in exchange for experience and feedback. This is, by far, the best way to develop your skills and boost your confidence quickly! If you’re brand new to Tarot, take the Tarot 101 course to learn the basics and get started straight away. Or if you’ve been reading Tarot for a while, dip into our bonus resources, including mini guides, keyword charts, worksheets, Tarot spreads and tip sheets to deepen your connection to the cards. Ask your burning questions about Tarot, get a second opinion on a reading or share your new ideas on the cards inside the Community forums. It’s a friendly, supportive place where you can talk Tarot 24/7 with people who share your passion and support your journey. Partner up with a study buddy to trade readings, swap Tarot card meanings, and cheer each other on. We do our best to create a perfect match! Here’s just a selection of the Tarot Topics & Masterclasses you’ll get instant access to when you join. You’re new to Tarot and you want to learn how to read the cards with a safe, learning group to guide you along the way. 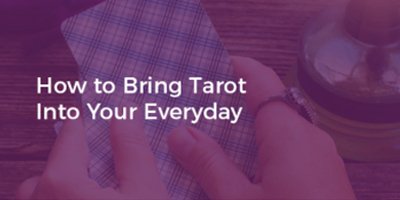 You’ll love the Tarot 101 course and our Beginner Masterclasses to get you started! You’re already reading Tarot for yourself and others, but want to develop your Tarot reading skills even more and get real life experience reading for people you don’t know. You’ll love the opportunity to practice your Tarot readings with real people on the Free Tarot Readings platform, and the monthly Tarot Topics to hone your skills. 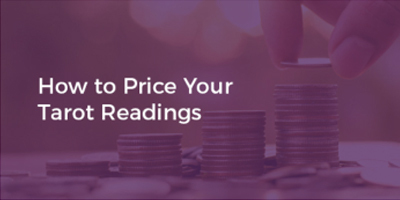 You’re charging for your Tarot readings and building a business, and you want all the support you can get from your peers as you step into this exciting new phase. You’ll love the connections with other Tarot professionals inside the Community and the Masterclasses specific for reading Tarot for paying clients. It was a great feeling to discover and being in the company of people from all over the world who, like me, are Tarot enthusiasts and are learning to read Tarot. The Biddy Tarot community gives me the confidence to see myself as a Tarot reader and to think of Tarot reading as a possible business in the (hopefully) not so far future. Thank you, Brigit! My journey to spiritual fulfilment, growth, and self discovery has taken major leaps and bounds thanks to you and the community you’ve created. 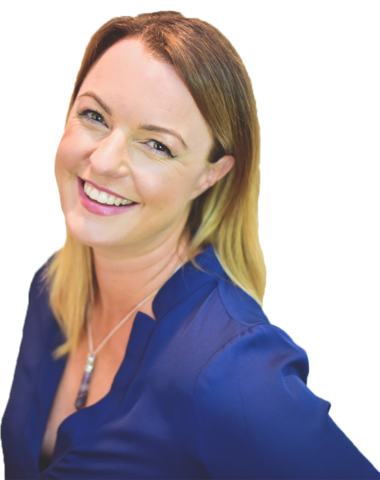 I’m the founder of Biddy Tarot, a professional Tarot card reader, and mum to two kids, Chloe and Zara. When it comes to developing your Tarot reading skills, I’m all about making it a simple, intuitive and fun part of everyday life that anyone can do. No special psychic abilities needed! I also know that reading Tarot cards is one of the best ways to deepen your intuition in your daily life. That’s why I’m on a mission to make Tarot a normal part of everyday discussions about spirituality and wellness, like yoga or meditation. 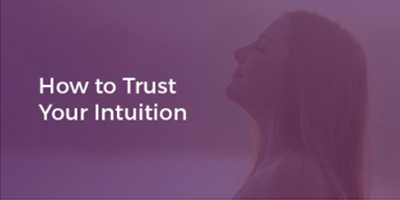 Because the way I see it, the more people who listen to their intuition and trust their gut… the better! You’ll get access to all of these tools, trainings and connections as a member of the Biddy Tarot Community, right at your fingertips whenever you want them. All in one place! But really, the thing you’ll love most about the Biddy Tarot Community isn’t just the trainings or even all the helpful tools you’ll receive. It’s the people. As a member, you’ll join one of the fastest growing discussions of modern Tarot in everyday life on the planet. And as a member of this inclusive and friendly community, you will have everything you need to become a more skilled, more confident Tarot card reader… and ultimately, bring more intuition and wisdom into your everyday life. The doors to the Biddy Tarot Community are NOW OPEN – but only for a limited time. Biddy Tarot is proud to be an official corporate partner of One Girl’s Business Brains program. In Sierra Leone, over 77% of the population live in extreme poverty (surviving on less than $1.25USD a day). Poverty prevents girls from attending school, and it means essentials like food and medicine are simply out of reach for many families. But we’re helping to change that. One Girl’s Business Brains program equips girls and young women with vital financial literacy and entrepreneurship skills so they can achieve greater economic independence. They’re empowered with small business skills and other career and life-skills to increase their earning potential, enable them to make informed choices about their future, and betters support themselves and their families. That’s why $10 from every new community membership is donated to One Girl’s Business Brains Program. Together we’re changing the world, one girl at a time. You’ll be directed to make a secure payment with your credit card. It’s 100% safe and secure! After your payment, you’ll receive an email with all the juicy details on how to access the Biddy Tarot Community. If you can’t find the email, check your Junk Mail or Promotions folder or contact the Biddy Tarot team here. What makes this different from other Tarot courses, forums and Facebook Groups? First, the Biddy Tarot Community is not just “another course”, or “another forum” or even “another membership group.” It’s so much more… and so much LESS at the same time. We know you’re already overwhelmed with ideas, techniques, interpretations, and information. That’s why we start with the end in mind and give you a clear TarotPath to follow, so that you have a clear, step-by-step approach, to become a better Tarot reader. Then, we give you the skills and practice opportunities to expand your natural gifts and talents. You’re never left alone to figure it out on your own. And second, “your vibe attracts your tribe”… We stand by our community values as a supportive, friendly and POSITIVE group. You’ll never feel excluded, judged, or isolated. It’s good vibes all the way, so you’ll have an instant cheer-leading team supporting you 100%. Yes. You can cancel your membership easily from inside of the Community dashboard or by contacting our team. Of course, we hope you LOVE the Community so much that you won’t want to cancel. We operate a strict no-refund policy. This means there are no refunds given for partial months or unused memberships (unless required by Australia Law – see our full refund policy here). Join the community, participate in the discussions and training and you will never want to leave, let alone get a refund! Can I upgrade my monthly membership to an annual membership once inside the Community? Yes, you can upgrade to the annual membership plan at any time, at the current annual rate. Simply contact our team when you’re ready to upgrade and we’ll send you the details. After your initial payment today, all memberships are billed automatically. If you’re on the monthly plan, you’ll be billed today and on the same day of each month. If you’re on the annual plan, you’ll be billed again in 365 days’ time and we’ll send you a reminder closer to the time. All of our prices are in USD. Please use a currency converter such as xe.com to approximate your local currency, keeping in mind that your bank may charge an additional fee for the transaction. I’m a total beginner when it comes to Tarot. Will I still benefit? Absolutely! That’s what the Biddy Tarot Community is about – to help you develop your Tarot reading skills and confidence in a way that enriches your everyday life. What better way to get started with learning the Tarot? I’ve also included the Tarot 101 Course, just for people like you, so that you can hit the ground running and read Tarot in no time. I also recommend that you post your questions on the community forum, so you can receive answers and encouragement from other people who read Tarot and find out what’s worked for them. I’ve been reading the Tarot cards for a while. Is there value in the Community for someone like me? You might find that there are a few things you already know that are included in the Community. Like the beginner basics covered in the Tarot 101 Course. No dramas – it’s a great sign you’re on track! But you might be surprised by a few things you don’t know… yes, even in the Tarot 101 Course. You see, there’s nothing like approaching something with a Beginner’s Mind and learning something new in the process. Tarot basics aside, you’re going to get an absolute kick out of the Member Forum, where there will be plenty of discussions that expand what you already know and help you make the cards’ meanings truly yours. Also, you may want to take advantage of the Free Tarot Readings opportunity, where members give readings to clients, in exchange for experience and feedback. This is the best way to work with a range of questions from all sorts of people, and speed up your growth. Especially if you want to be paid for your readings, or want to read for people who aren’t your friends and family. So, in short, yes, I do think you’ll benefit particularly if you’re ready to go deeper with the Tarot cards. I don’t use Rider Waite. Will I still benefit? Do I need special training or experience to read on the Free Tarot Readings platform, or can I start straight away? 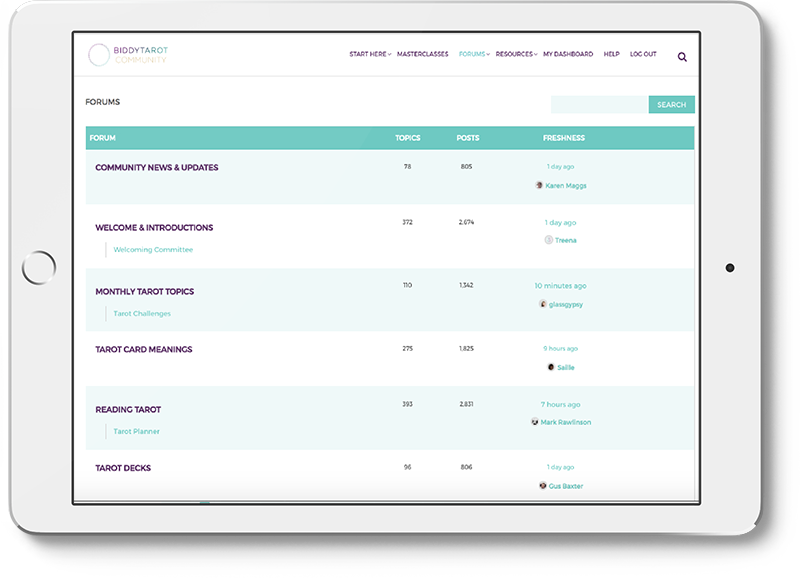 You can start reading on the Free Tarot Readings platform at any time – you don’t need special training or experience. However, I recommend completing the Tarot 101 Course first (inside the Community) and doing a few Tarot readings for yourself, friends and family (or your fellow Community members). That way, you’ll be ready to read Tarot for strangers! What if I have a specific question that is not addressed here? Contact the Biddy Tarot team here. Join the community of regular, everyday people who are saying YES to their intuition by reading Tarot cards! The experience on Free Tarot Readings has been absolutely invaluable. I can definitely say that I would not be reading professionally if I hadn’t had that experience and feedback. Biddy Tarot has without a doubt been the most influential source for my tarot reading journey. With Biddy Tarot, I feel I gain more understanding about Tarot everyday. I feel quite confident now doing a reading and have had some very positive feedback. Biddy Tarot is inspiring and everyone concerned is so very helpful and caring, you feel the support there at all times. 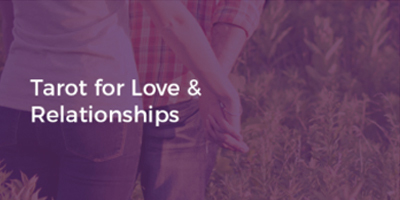 Finally – it’s time to put an end to feeling alone once and for all! You’ll know if this is right for you – trust yourself and join TODAY!